This is the second in a three-part blog series about installing solar panels. While solar panel installation has become simpler over the years, it’s certainly not a typical DIY process. Even a qualified electrician needs solar installation training on a roof and must become familiar with local permitting and fire code requirements to complete a safe and reliable installation. 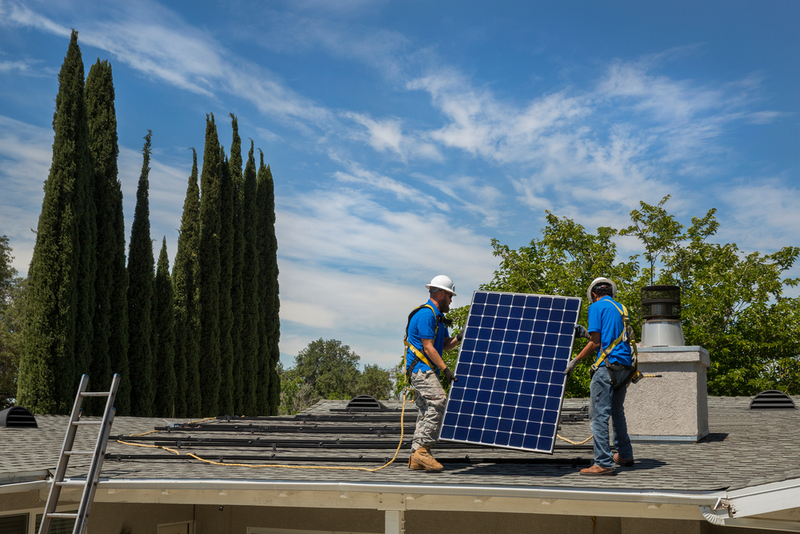 If you’re interested in learning how to become a solar installer, visit the Department of Energy’s solar training network or fill out this form to get more information about joining SunPower's dealer network. If you’re just interested in knowing how solar is installed on your roof, here's a quick five-step guide. To find a solar installation professional, you might ask friends or neighbors who already have solar. They may be able to refer you to a great local installer who can give you a free quote. You might also get a quote from a local installer who is part of our network of solar installers who are SunPower-Certified independent contractors. Once you choose an installer and secure your financing method, the solar system installation process can begin. In the design phase, the solar installer will evaluate your home to determine the best solar panels, inverter, racking and other components. SunPower dealers often recommend our SunPower Equinox™ platform, an integrated solar system that combines SunPower® solar panels, micro-inverters and other components all covered under SunPower’s industry-leading Combined Power and Product Warranty. Other installers will design systems with components that may come from several different manufacturers, all with different warranty terms and services. As part of the evaluation, your solar installer will make an appointment to inspect your attic, your roof and your home’s electrical system. He or she will determine the best location to mount the hardware that runs your system (often in your garage or another unobtrusive area). During the inspection, the installer will evaluate your property to ensure that the installation is code compliant and will recommend upgrades if required. For example, if you have an older home, your electrical panel may need to be updated, or when inspecting your attic or roofing, the installer may discover issues that require repair before your system is installed. Once all of the information and measurements have been gathered in Step 2, the solar installer will create a solar engineering and site design plan. The plan will include the number of panels and where they’ll be placed on your roof, the wiring of the system and how it will be interconnected with the utility. The design plan should also ensure compliance with local fire safety requirements. The installer will then submit these plans to your city/county permitting departments and to your utility company. Unfortunately, most cities, counties and utilities have different requirements that can vary greatly and can be confusing, even for solar pros. Make sure you find an installer who is familiar with the local building codes and the local utility companies. The design and permitting phase typically takes approximately one to three months, depending on the jurisdiction. Your installer should keep you informed about the progress and let you know when it’s time to schedule the physical installation date. In some ways, the actual installation is the easiest part of going solar. You might need to be present when the installers arrive so you can give them access to your roof and to the electrical system of your home. If you have pets, make sure they’re safely secured. If you’re interested in watching, your installer will let you and your family know where to see all the action — and there will be action. These days, typical solar installations can be completed as quickly as in one to three days, depending on the size of your system. After the solar panels are attached to the roof and the related electrical and monitoring equipment is mounted, the installer will clean up the work area and begin the last phase. As with permitting, each city, county, and utility has its own final inspection and approval requirements for solar installations. The city and/or county inspector will visit to make sure that your installation was completed as planned in the granted permit. The inspection process can vary widely and can take anywhere from a few days to several weeks, depending on where you live. The utility will inspect and sign off on the installation before it’s officially connected to the grid. Once again, this interconnection waiting period can take days or weeks, and as with permitting, the regionally based installers may be able to navigate through the system more efficiently and keep you personally informed about how things are progressing. After all city, county and utility approvals are obtained, your installer will be ready to flip the switch, and you can have the thrill of seeing your meter spin backward and/or your electricity bill decline as you generate your own clean energy. See how much you can save with our solar savings calculator, or contact a local SunPower certified dealer for a free estimate and to find out more about typical installation time for your home. 1 Incentives, rebates, and tax credits vary and are subject to change. SunPower does not warrant, guarantee or otherwise advise its customers about specific tax outcomes. Consult your tax advisor regarding the solar tax credit and how it applies to your specific circumstances. Please visit the dsireusa.org website for detailed solar policy information.